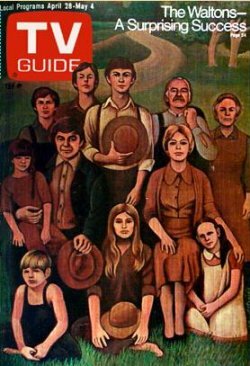 The TV Guide cover for April 28, 1973. The year is 1934 because fifty-five years ago, on on the sixteen of this month in 1879, Maggie and Michael MacKensie were married. According to the vet it is "one of the most beautiful fall days"
Grandma snaps string beans from the "last crop of the season"
It is summer because Grandma says John-Boy is happy that summer vacation is almost here. It is around the end of June or the beginning of July because Mr. McCreary says the Methodist Church gets awfully hot in July and Ben says he doesn't have firecrackers to shoot off on the fourth of July.